Hi- it’s 1.00pm and I am finally sitting down after the Farmer’s Markets this morning (all the tatsai sold out by 8.30- I need to get up earlier) then the gym on the way home and the week’s green supply are now all washed and in the fridge. Today I used anything remaining from last Sunday- 7 stalks of spinach/ bunch of parsley and 3 bokchoy.Yesterday I found a 250 ml can of mango juice with no added sugar at a local Asian store -you can buy this in Egypt in tiny cans- called assir manga- nothing to do with Japanese animation! I blended the greens and mango with 12 ice blocks/ an orange / lemon and lime juice/ ginger/ 2 table spoons ground chia/ handful of koji berries/ pear and a frozen banana. I started using ice during the week in my smoothies and have discovered the more ice I use the less frozen banana and fruit I use – the ice makes the smoothie really icy thick and creamy. Another plus is that you use more greens. During the week I used a bunch of curly kale that was labelled Scottish kale. There are so many different varieties of kale that are easily grown but we rarely see them for sale like a lot of other greens sold at the local farmer’s markets that are ignored by the supermarkets. We grew up eating cooked carrots, corn, broccoli, potato, peas, brussel sprouts and pumpkin- they were the standard veggies we ate because that was what was being sold. Mum also made coleslaw and basic salad- using cabbage, grated carrot, tomato and iceberg lettuce. We always had celery and carrot sticks in our school lunchboxes with our vegemite / devon with tomato sauce white bread sandwiches. Of course later we widened our palates and ate more European/Asian/Middle Eastern foods with more variety than our parent’s generation of standard meat and 3 veg. The kale got me thinking about green smoothies and how when you start getting into them you discover all the different types of greens you can use. Victoria Boutenko believes that greens should be in their own category because nutritionally they are very different to vegetables. The supermarket sections would be labelled Fruit, Vegetables, Greens. If that happened then the buyer would have to source all the different greens that are being grown to fill up the new Green’s section- which would not be hard. 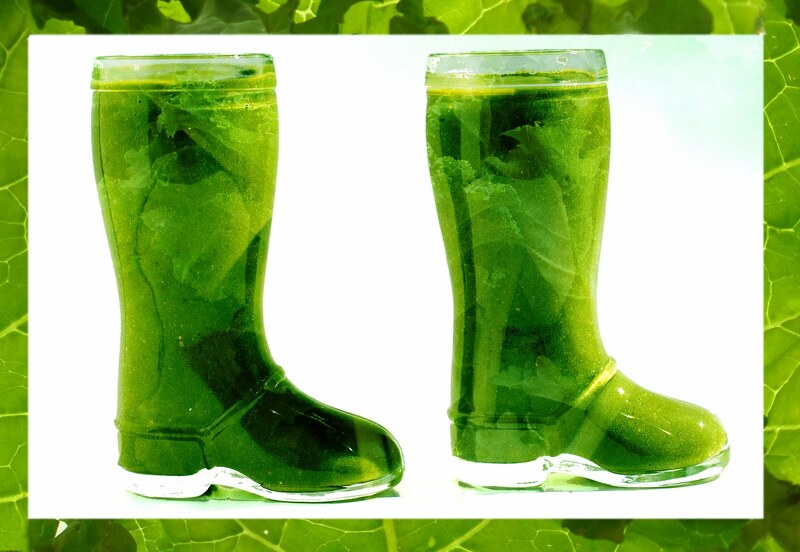 In this ideal world more people will discover the magic of greens and of course healthy fresh raw green smoothies! So this week I want to celebrate green smoothies and different ingredients and giving the BOOT to the boring- if you are stuck on using baby spinach in every green smoothie you make try some other greens- and if you can’t find any variety at the local supermarket/markets ask their buyers to be less boring in their food selection! Maybe we will find MORE kale on the shelves if this happens.